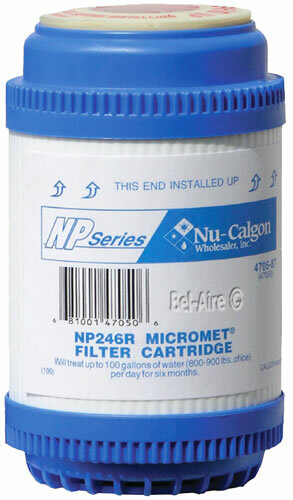 The NP246R cartridge treats water with Micromet® and inhibits lime scale formation. Micromet 6R is an NSF Listed, food-grade, slowly soluble polyphosphate, which dissolves slowly into the water and stabilizes the hardness minerals, thereby preventing scale formation. The NP246R cartridge contains 1 pound of 6R that is sufficient to handle up to 100 gallons of water per day for six months. Made with FDA-approved materials. Model NP246R, Part Number 4705-87.